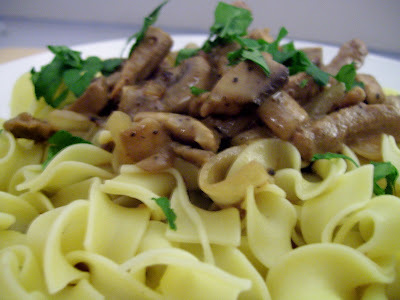 JUST VEGGING OUT: This Mock Beef Stroganoff Looked Good When I Made It . . . . This Mock Beef Stroganoff Looked Good When I Made It . . . . But it ended up tasting crappy-ish. Last night, I took one of my favorite recipes from my meat eatin' days, Grandma Roach's Beef Stroganoff, and tried to veggie hack it using these steak-style strips from Lightlife. Instead of beef broth, I used mushroom stock and vegetable broth. I also omitted the sherry and the tomato paste, and substituted olive oil for the butter. Had I just bought a couple of large portobello mushrooms, cut them into strips, and used them instead of the Lightlife steak strips, I think the dish would have been fine. Now, I'm afraid to use the package of Lightlife's ground beef that's been sitting in my 'fridge for the last two weeks. I'm open to suggestions. Assuming the package of Lightlife isn't past "use by" date, I'd make a bolonese sauce or a batch of vegan chili. Agreed on the portobellos with the strips; I wonder if you'd mixed them half-half strips and portobello slices and used the sherry, cutting the mushroom stock if that would have reduced the saltiness. Might want to check the sodium level on the 'shroom stock. Another recipe modification: If you want to keep the protein level up while using portobello mushrooms only, try a high-protein pasta and use a Greek yogurt instead of the sour cream (yogurt has more protein). Rayne, thanks for the suggestions. I'll try to find a recipe online for bolonese sauce or vegan chili. The mushroom sauce, made from the mushroom broth, tasted fine. Not salty at all. It was the coating on the steak strips themselves that I found excessively salty. I suspect a lot of that comes from the soy sauce used to make them. I like the idea of using high-protein pasta (seen it stocked, but never tried it before) and Greek yogurt for added protein. I love this recipe for vegan stroganoff. It replaces beef with portobello mushrooms and seitan.